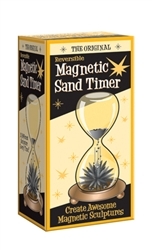 It looks like an ordinary hourglass, but instead of sand the insides hold iron filings. In the base of the timer is a powerful rare-earth magnet. When you turn the timer over the 'sand' falls through but then starts to form a unique sculpture due the ferrous material interacting with the magnetic field. Each time you turn it over you get a different pattern/sculpture!